You might not have heard about Keter, but you have probably seen their products around, especially their Cantilever Organizer. You can find their boxes in all kinds of stores under many different names, but now you can find an actual Keter named 18-Inch Cantilever Tools Box at Sams Club at a really good price. I first saw the Keter Cantilever Organizer as part of a Kreg Jig kit, but it can also be purchased as a Kreg addon. Additionally, the 22-inch version is sold under the Husky name, the Craftsman name and many others. Though the name changes the prices are usually pretty similar, but the price on the 18-inch model is the lowest I have seen. The same model on Amazon sells for just over $28, but at Sams Club you can get it for just under $17. You can pick up the Keter 18-inch Cantilever Organizer locally at Sams Club or you can buy at SamsClub.com and pay a few bucks more for shipping; either way, it is a great deal. Find Keter's Master Pro Cantilever Organizer in http://www.keter.com ! Watch and learn how to use the Master Pro Cantilever from Keter Plastic! 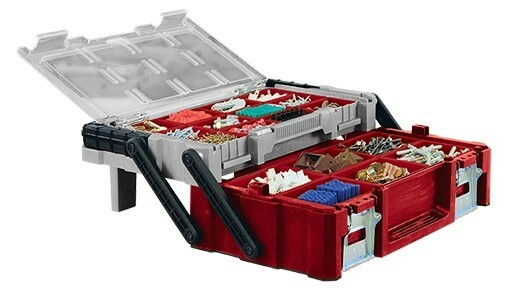 Keter specializes in the design, manufacture, and supply of plastic tool storage solutions and provide a range of reliable, top-notch plastic tool storage options such as plastic boxes, plastic sawhorses, plastic tool organizers, and other high-quality storage equipment and accessories.